Moscow born pianist and composer Yelena Eckemoff is back with her eleventh album entitled, In the Shadow of a Cloud (L&H Production). Eckemoff has earned a reputation as a creative composer since her background is not jazz, but classical. Eckemoff naturally blends classical compositional elements such as through-composed form with open-ended jazz improvisations. 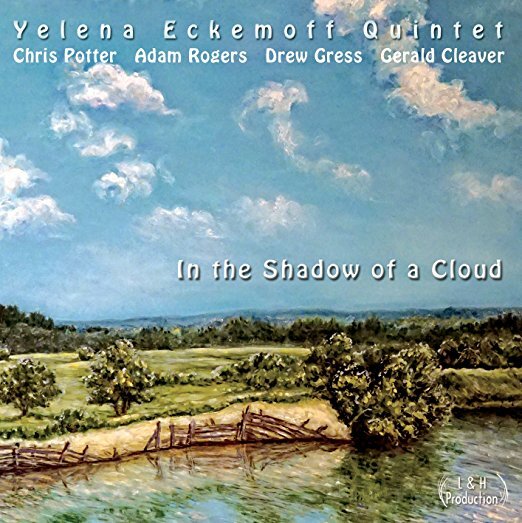 In the Shadow of a Cloud is a double album with a group of heavyweight musicians from New York: Chris Potter on multiple reeds and flute, Adam Rogers on guitar, Drew Gress on bass and Gerald Cleaver on drums. Though the group has played together in various combinations and settings, this is the first time they have all played together at the same time. Some of the feelings and emotions Eckemoff found musical inspiration from was based in her childhood memories of growing up in Russia. In the Shadow of a Cloud stands as an evocative soundtrack for the life she left behind in Russia when she and her husband emigrated to North Carolina in 1991. Whether it’s her memories of the sound of grasshoppers in a country field, the massive iron railroad bridge with wooden walkways near her home, her grandpa’s motorboat, the sensation of swinging in a hammock with her mother, or the fragrance of wild lilies mixed with the smells of warm asphalt and potatoes and onions frying on kerosene burners. The opening title track is moody and atmospheric with elements of polyphony between the instruments. Potter is on tenor saxophone on this selection and delivers a powerful solo that culminates in a climax of burning free blowing in the rubato section. Eckemoff’s solo is as atmospheric as the composed material, it is clear that she has a very definite image and emotion she is portraying in this track. Cleaver and Gress have a strong connection and their support gives life and motion to the track. “Waters of Tsna River” is a 5/4 pulsed composition that finds Potter on flute. The band seems to be inspired by the vision of the music, and Rogers solo is in top form. His lines are influenced by Cleaver’s rhythmic choices as he builds his solo. Eckemoff is also in fine form on this selection, digging into the time and conjuring musical visions with her adroit harmonic motion and righthand lines. The double disc maintains its cohesiveness by means of fusing jazz and classical sensitivity with a great balance, and of course the amazing band Eckemoff has compiled, but in this case, they are inspired by the uniqueness of the compositions, which are sophisticated, full of developed themes that weave through various feels and permutations. There are moments of classical chamber music lyricism and moments of more jazzier swinging improvisations. In the Shadow of a Cloud exemplifies the musical images that can be evoked by the fusion of styles, captivating the energy and spontaneity of jazz with the elegant forms and melodic development of classical music, though the music is complicated and cerebral at times, it is fresh enough to ensure the attention of the jazz music lover. Well done throughout. Be the first to comment on "Yelena Eckemoff | In the Shadow of a Cloud"